There are many instances in which you may want to design a custom entry door for your home or office. The look is one of elegance, and this type of door is usually so well made that it will last longer than less expensive doors. You may want to add a custom door to your home design when you are preparing to have a home built. This will make your home stand out and give it a look of luxury. These doors do not need to break the budget for your new home. Some custom-made doors are expensive, but they are not all priced out of the range of the average homebuilder. The techniques used today to make custom doors are sophisticated, so that even doors with moderate prices are nicely designed and well made. There are many types of doors available, but off-the-shelf models won’t usually give you the same look as custom doors. When you remodel a home, you can work with door manufacturers to gain their insight into the custom configurations and options available to you. Unusual sizes and shapes can be selected, and they will help your home look less like the cookie-cutter homes that may also be built in your neighborhood. It’s the first thing most people see, and lends perceived value and actual value to your home. You can create a wonderful new look for your home by having a custom door designed. You may need to have a custom door installed by a professional, as well. You don’t want to ruin the look by trying to install a wonderful door yourself, if it’s out of your field of expertise. Custom door installation difficulty may escalate depending on the options you choose, like materials, hardware, transoms and sidelights. The craftspeople who create custom doors will give your project much attention to detail, quality and design. Woodworkers may add custom glass to your door, to give it a more glamorous look. This will also allow more light to enter your home, giving it a bright and well-lit look. Nothing makes a better first impression than a custom front door and attractive landscaping and walkway. The doors also make a subtle statement about your family – that you appreciate beauty and timeless good looks. 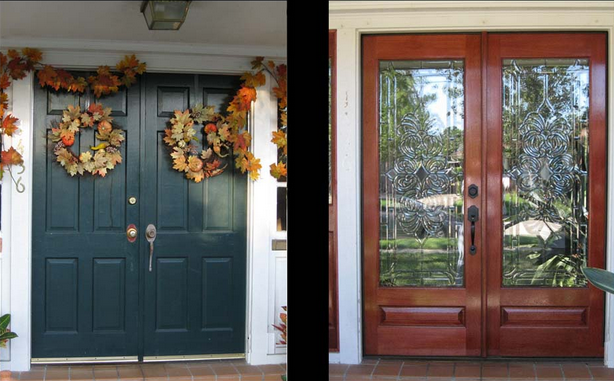 New entry doors add value to homes. There is no disputing this. If you are in an area where many homes are for sale, a custom door will help your house to stand out from the rest, states a recent article on the DIY Network. The staff you choose to help with your custom door should be dedicated experts in the field. The people who create your door for you should be knowledgeable about the styles and options available, and friendly, so that you are comfortable when you are making decisions about a custom entry door. Your custom door may include stained, textured, beveled or leaded glass, depending on your preferences and the advice of your designer. Impact resistant, tempered and insulated glass are all options from which to make your choice. Custom entry doors may be made with jambs and pre-hung for your entryway. The manufacturer can do as much or as little as you like to your door, so that it speaks for you about the style and elegance of your home.